Finally - ketchups that actually taste like tomatoes, BBQ Sauces without any weird color additives and a cocktail sauce as fresh and bright as the seafood it accompanies. Almost two pounds of organic tomatoes go into every bottle of Red Duck Ketchup. They ripen on the vine and are picked RED when tomatoes are supposed to be picked - from late June through July. Even better, our tomatoes go from field to purée in less than four hours. 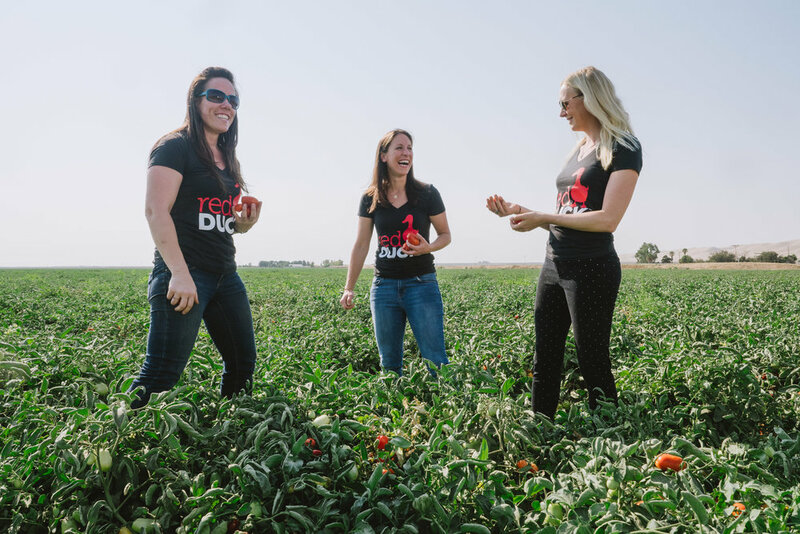 Our tomatoes are grown in the Central Valley of California. There, the climate is such that we can source a consistent tomato so you know that your next bottle of Red Duck product will taste just as delicious as the past. We work with small to medium-sized farms, many of which have third and fourth generation farmers who are LEOPOLD CONSERVATION AWARD winners. And how about those spices? We're glad you asked! Each of our products contain a unique organic spice blend that we developed. Some condiments you just dump on to food. Not ours. we want our flavors to be so complex that you look forward to what's in the jar almost as much as what you're putting it on.